This affordable thermally treated acoustic certainly has the looks, but all-solid models still have the tonal edge. Old acoustic guitars are often said to have a magic that an off-the-shelf acoustic can’t match; while that may be partially down to indefinable vintage mojo, there is some truth to the tone: older woods tend to possess a stronger projection, courtesy of a top that has dried and stiffened over the decades. In recent years, guitar manufacturers have aimed to replicate this process with torrefaction, which has become the hottest buzzword in acoustics - quite literally: it involves heating tonewoods to artificially age the wood, remove moisture and stabilise its molecular structure. 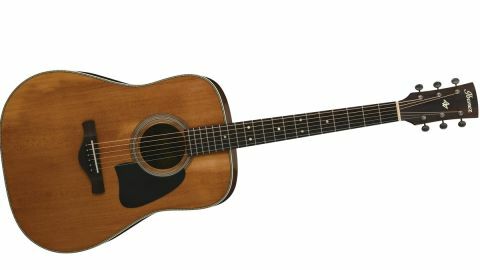 The process started appearing on instruments from small builders and high-end models from the likes of Martin, but has trickled down to mid-priced acoustics, with this Thermo Aged dreadnought from Ibanez a prime example. What strikes you first is the sweet honeyed colour of the solid Caucasian spruce top; it’s a world away from the oft-anaemic spruce that can grace guitars in this price range, and gives it a well-worn vibe. Ibanez has gone all-out on that front, with herringbone purfling, a weathered scratchplate, aged machineheads, gold mother-of-pearl dot inlays... Hell, even the internal label is aged, and the bone nut and saddle are a nice touch at this price, too. The only area we’re not sure about is the slightly fake-looking worn laminated headstock; otherwise, this is the most old-school cool you’ll get for under £500. That vintage feel continues to the playability; the satin-finished neck’s pronounced V shape distinguishes this acoustic from much of the competition, while the ovangkol fingerboard and bridge do a good job of imitating rosewood in a CITES-friendly format. A flawless build makes for slick, tidy playability, whether strumming or fingerpicking - although the guitar’s tonality will influence your approach here. There’s a trim bass response from the AVD11; it’s not as boomy as you might expect from a traditional dreadnought shape, which should translate well in a full-band mix. However, that light low-end makes it better-suited to bashing out big open chords than delicate fingerpicking, although there’s a sweet midrange and rounded high-end that further channels that rootsy vibe, where the pre-aged top really proves its worth. The fly in the thermally treated ointment is the model’s laminate back and sides; an all-solid model might eke extra oomph out of the format. It’s hard to argue with the appearance and build of the AVD11 at this price. Still, it might be worth spending an extra couple of hundred for an all-solid version to make the most of the Thermo Aged format’s tonal advantages.